The UTW (“Under Ten Words”): Upscale luxury experience partly suffers due to service limitations. The must-dos (if any): Relax in the refurnished rooms, have cocktails and canapes at the 31F Executive Lounge. 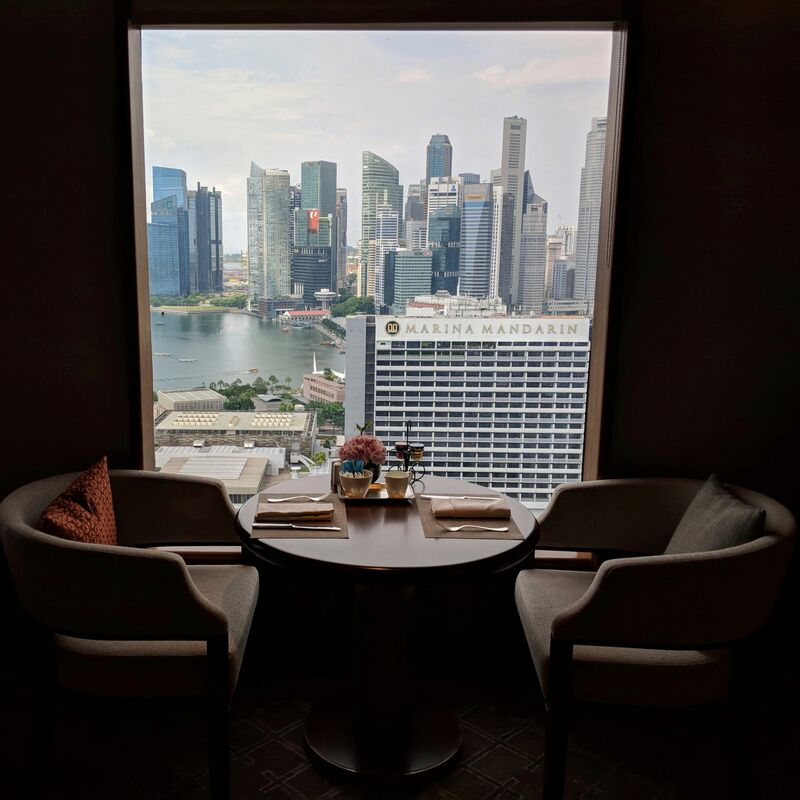 Intro: In July 2018, in the midst of completing the Hilton Honors Diamond Status Match, I checked into the refurbished Centennial King Suite at the Conrad Centennial Singapore, which gave me access to the Executive Lounge on the 31st floor exclusive to suite and premium guests. 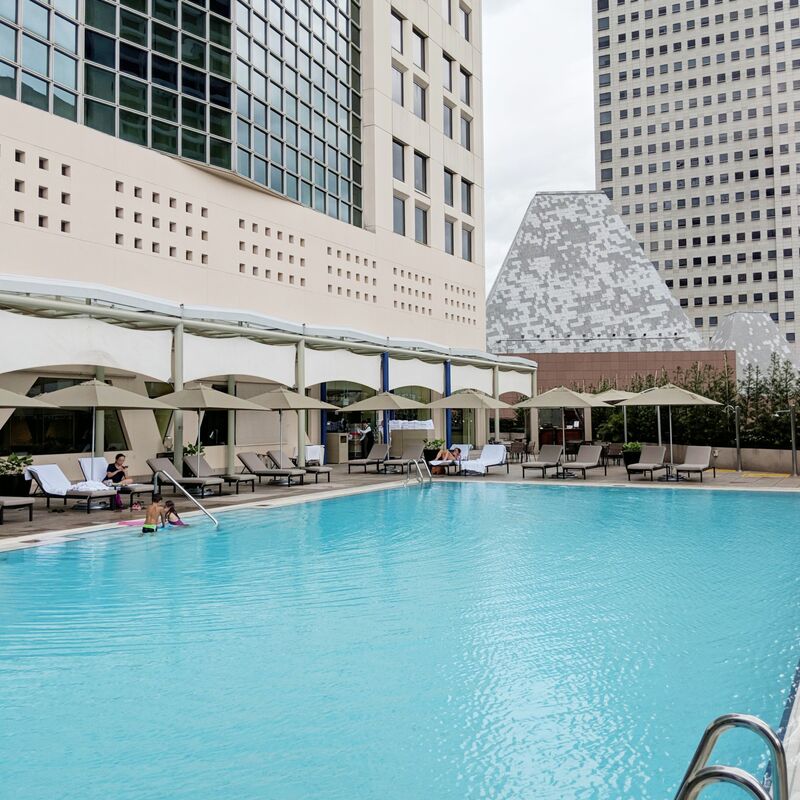 Whilst the Conrad brand of upscale luxury provided suitable indulgence, the hotel appears unable to fully accommodate its immense popularity, resulting in frequent lapses of service standards which distracted from the Conrad experience. 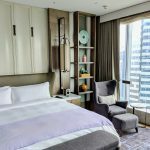 The recently-refurbished 63sqm Centennial King Suite plays it all sunlit Japanese business modern in design, with a separate living area with a long daybed and a bedroom with a king-sized bed. The spacious bathroom comes with a double vanity sink, bathtub with complimentary bath salt and rubber ducky as well as a separate shower stall with rain shower. 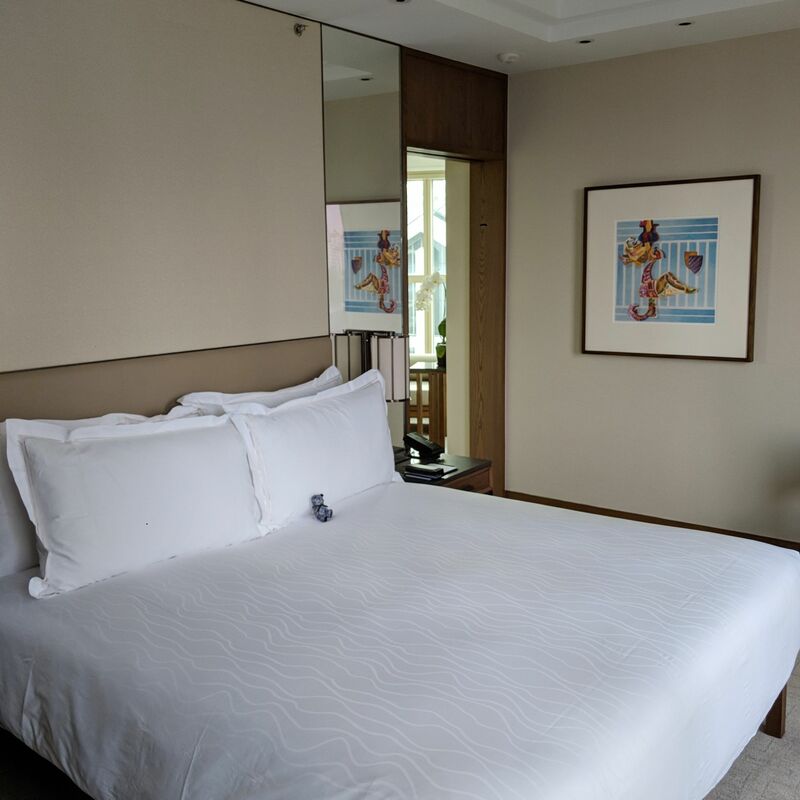 The suite also comes equipped with a mini-bar and Nespresso coffee machine, as well as a complimentary Conrad souvenir mascot teddy bear which greets you on the bed. (Other properties charge for their mascot plush.) On top of all these, I received a complimentary bottle of red wine for being a Hilton Honors Diamond member. 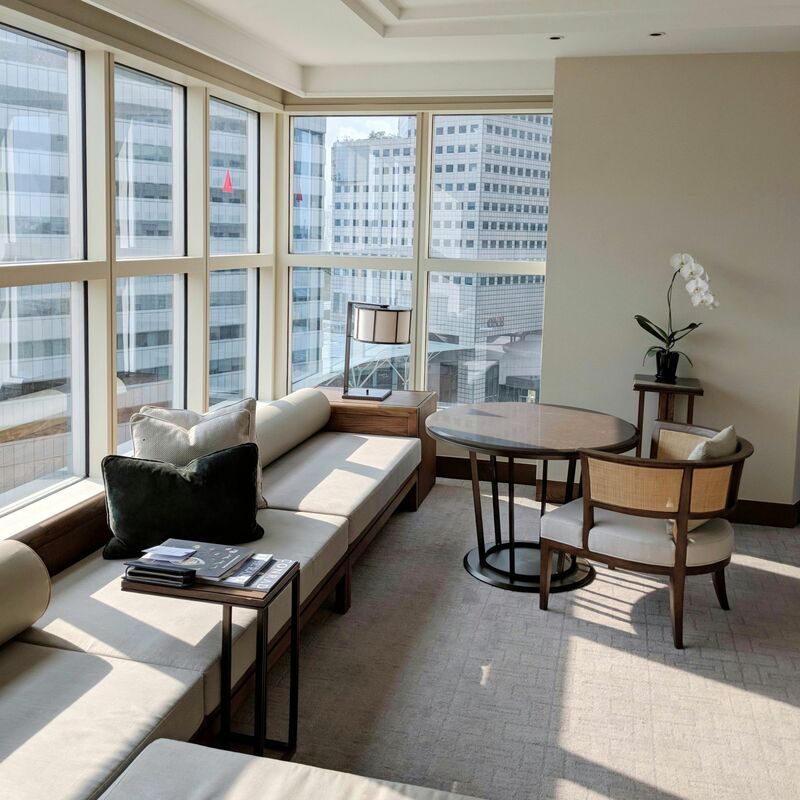 The living area in the Centennial King Suite, which overlooks the Fountain of Wealth at Suntec City, has a healthy stream of natural sunlight which gives the proceedings a homely cosiness. The aesthetic somehow reminds me of the rooms at Andaz Singapore. 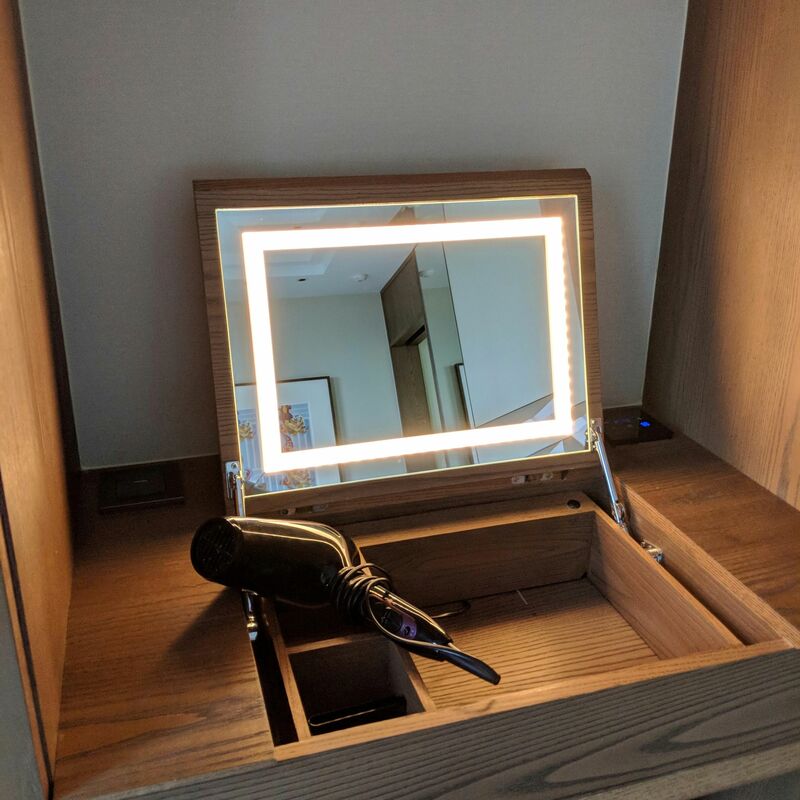 A little feature which I really appreciated was the bedroom light-up vanity with attached hairdryer (hair brush for in-room karaoke not included). You’d be surprised by how few properties these days pair the vanity/mirror with a hairdryer/power point. Living area, Centennial King Suite (Conrad Centennial Singapore). 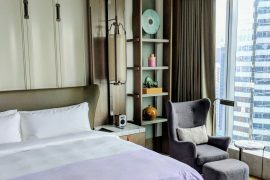 Bedroom, Centennial King Suite (Conrad Centennial Singapore). Vanity, Centennial King Suite (Conrad Centennial Singapore). 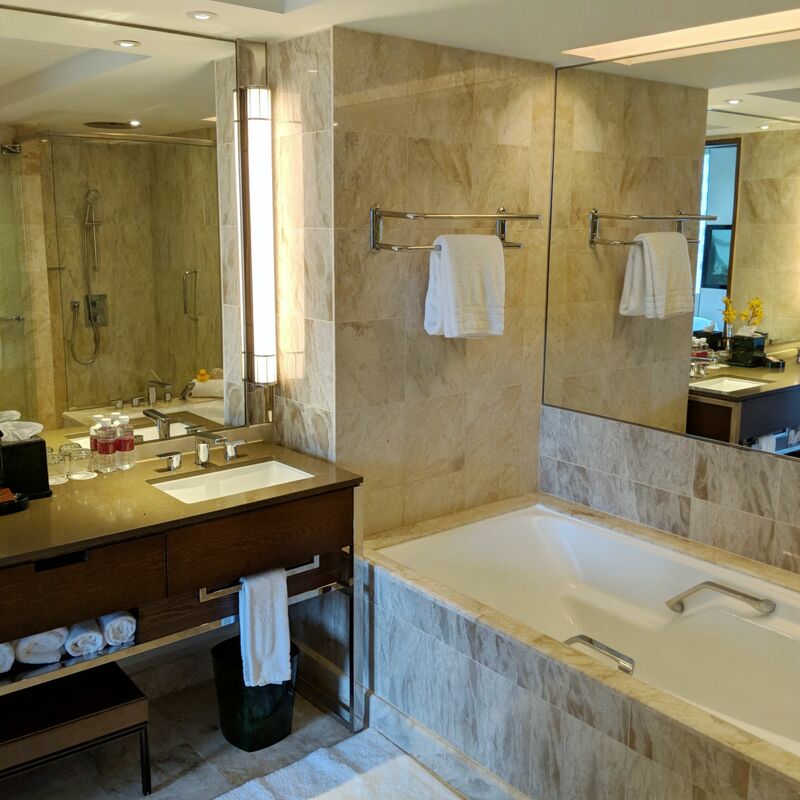 Bathroom, Centennial King Suite (Conrad Centennial Singapore). 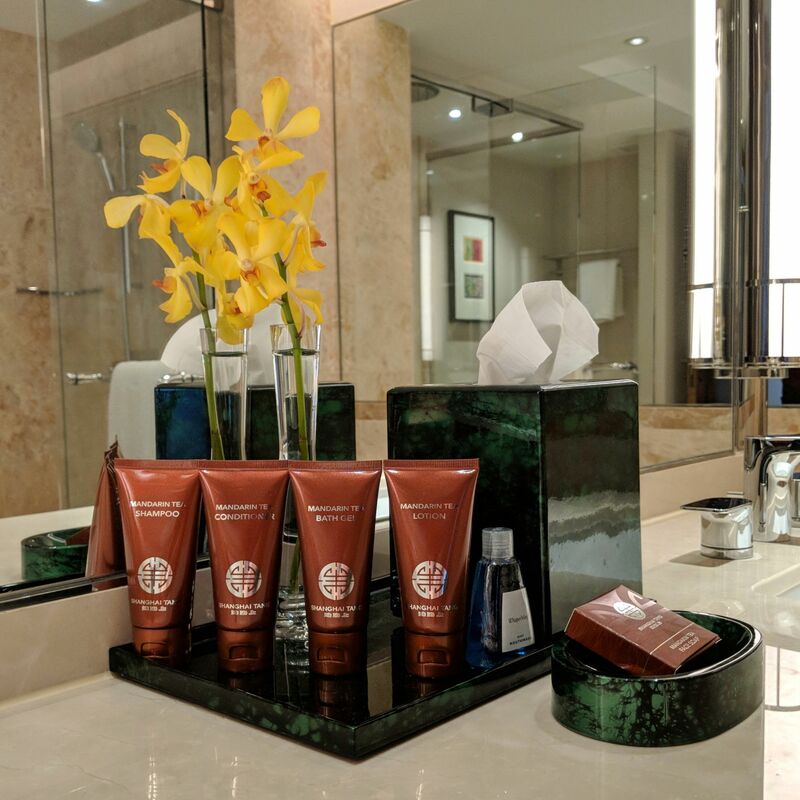 Shanghai Tang bathroom amenities (Conrad Centennial Singapore). 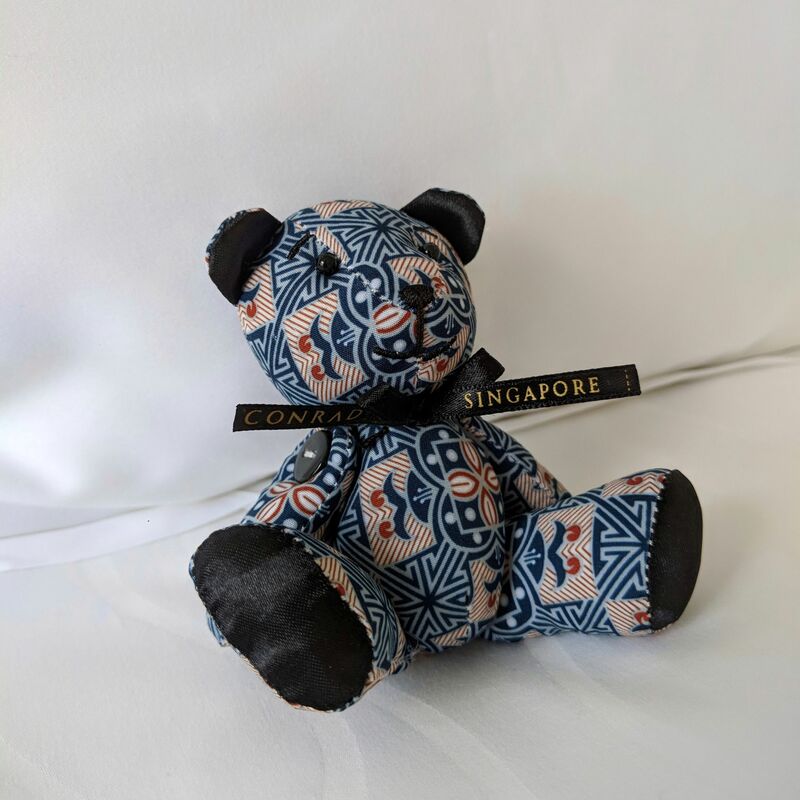 Conrad mascot bear (Conrad Centennial Singapore). I checked into the hotel at 3pm, and was greeted by quite the international crowd at the front desk, from an Indian gentleman ahead of me who took up more than ten minutes with the making of his reservation to a Hong Kong couple who (politely) jumped ahead of me in the queue as they had realised after checking out that they had left their belongings in the room. 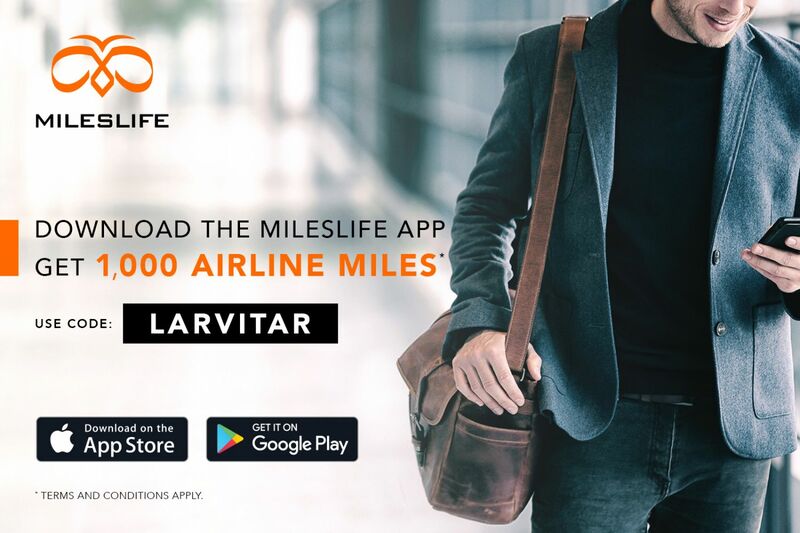 Elsewhere, a Chinese family complete with baby stroller and four balloons hanging from the back handle stood to my immediate right ahead of two young staycationing Singaporean couples, with a Filipino entourage lingering in the surrounding area. Very buzzy. As I expected to be able to escape from the madding crowd and check in at the Executive Lounge being a suite guest and a Hilton Honors Diamond member, I got the attention of a hotel staff and asked if I could do that, but was told that I had to register with the front desk for card access to the Executive Lounge. Hmmmm. Fifteen minutes of lobby lounging later, it was my turn. Unfortunately, I was informed that the Centennial King Suite would not be ready until at least ninety minutes later, and I was subsequently issued a holding room for my resting purposes until my room was available, with my check-out time the next day correspondingly extended until 5.30pm. 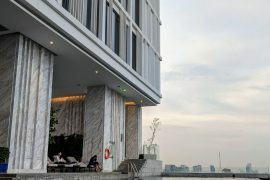 The consequence of the hotel’s popularity and corresponding extent of occupancy would surface again later on during breakfast at Oscar’s and at the Executive Lounge itself. The hotel’s pool, gym and spa are situated next to the Executive Lounge on the 4th floor, which is undergoing refurbishment at the time of this post. This poolside Executive Lounge is intended to cater to general club guests as well as Hilton Honors Diamond members. 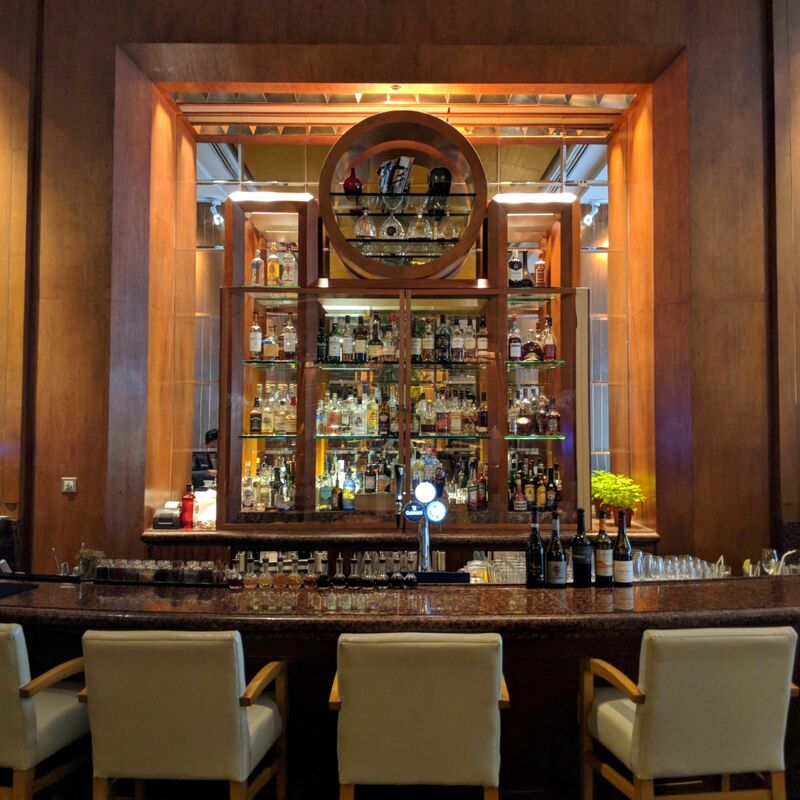 Because of the on-going refurbishment, the entire hotel’s club guests were directed to the Executive Lounge on the 31st floor which is normally reserved for suite and premium guests. 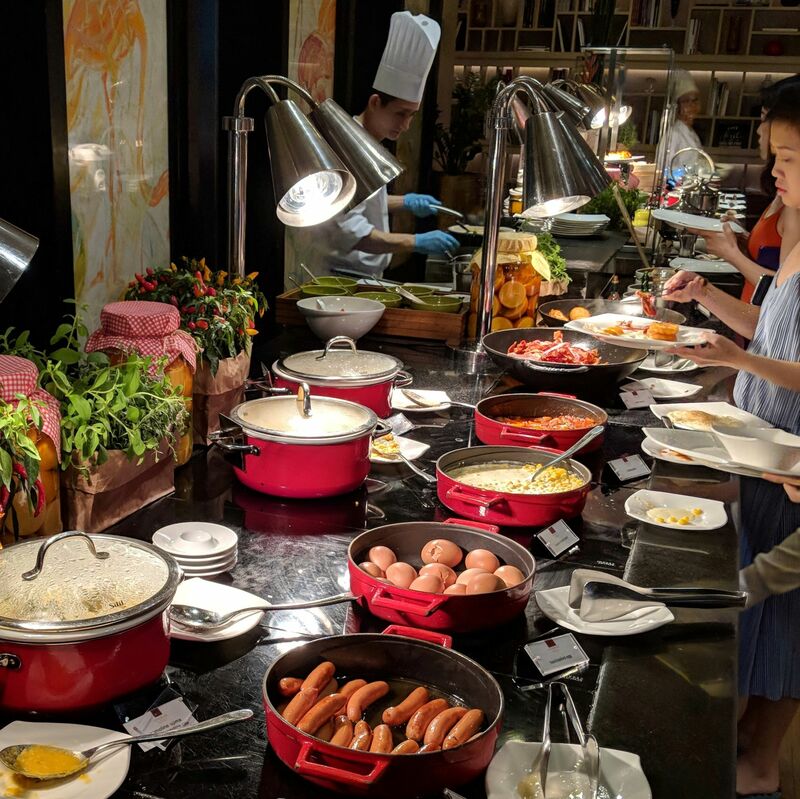 Breakfast is served at Oscar’s, the hotel’s international buffet restaurant. Apart from the usual Western breakfast staples like bacon and eggs, there are flashes of local flavours present such as kaya jam at the toast station, warm soya milk with you tiao (fried dough fritters) and nasi lemak (aromatic rice infused with coconut milk and pandan leaves, served with local anchovies, peanuts, eggs, cucumber slices and sambal). 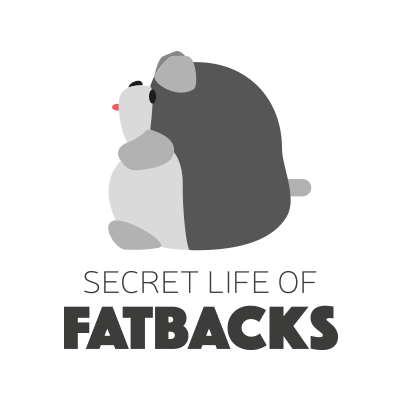 The pancakes were a highlight, possessing a McDonald’s hotcake-esque warmth and vitality while being significantly fatter like a hippopotamus. Whilst the breakfast spread did its job and then some, when I arrived at Oscar’s at about 10am, there was a ten minute queue before I was eventually seated. (I experienced a similar waiting time the last time I was at Conrad Centennial Singapore, which suggests this wait is the norm.) By this stage, the hotel does come across as doth overfloweth. 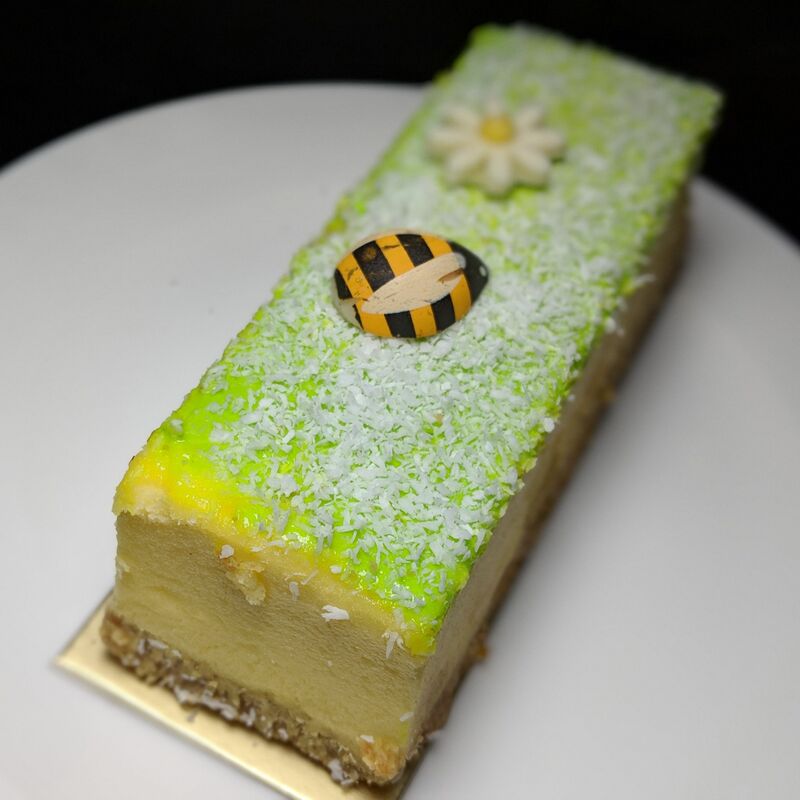 Elsewhere, the Terrace provides a selection of cakes and pastries, while the Lobby Lounge offers afternoon tea and daily bites in the day as well as cocktails and bar bites at night. 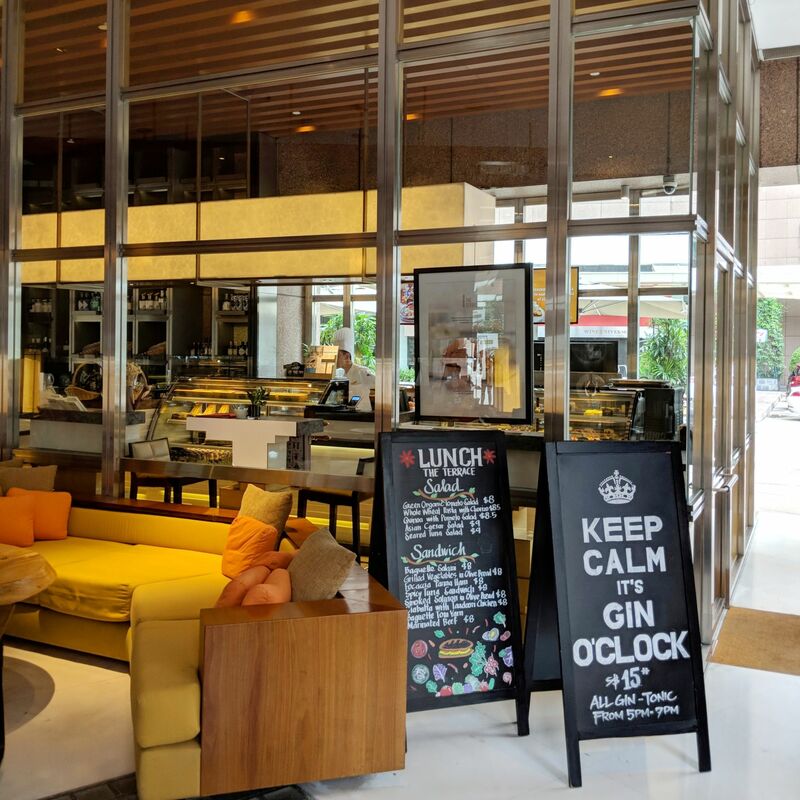 Look out for their signature Gin Experience – premium gins paired with craft tonics from East Imperial and over thirty different garnishes – which features at an attractive price during the lounge’s happy hour timing. 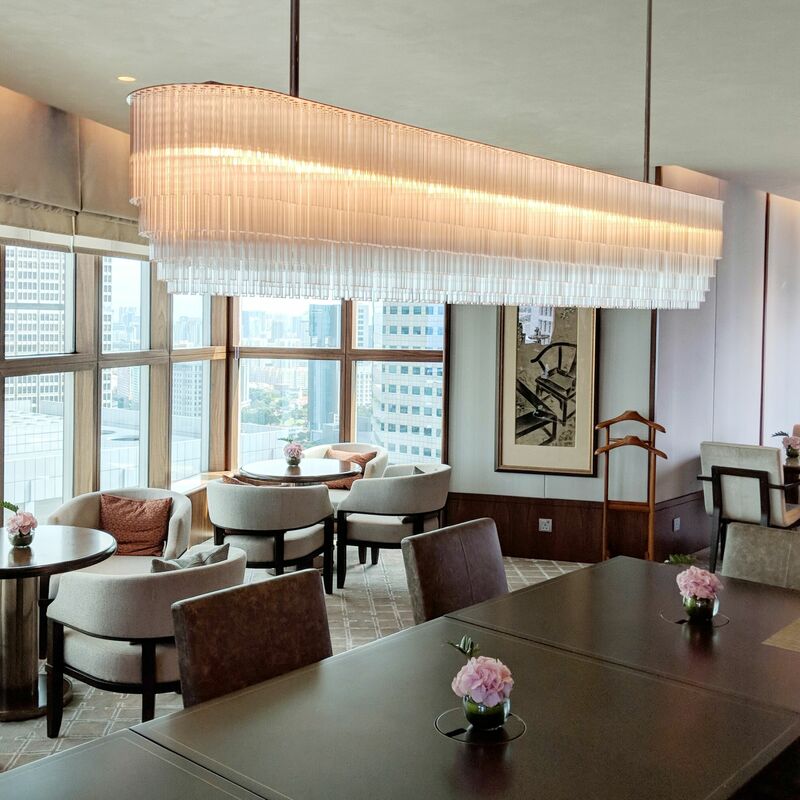 Golden Peony is the hotel’s Chinese restaurant, serving refined Cantonese dishes, dim-sum and an extensive wine list. Breakfast at Oscar’s (Conrad Centennial Singapore). 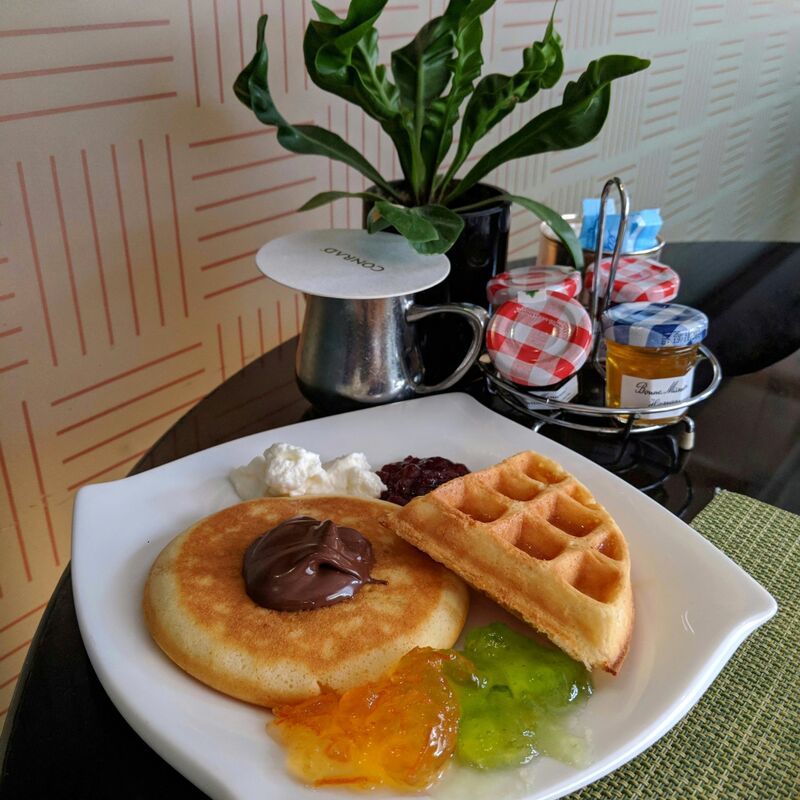 Waffles and pancakes for breakfast at Oscar’s (Conrad Centennial Singapore). Lobby lounge (Conrad Centennial Singapore). Gin & Tonic Cocktail from the Gin Experience menu at the Lobby Lounge (Conrad Centennial Singapore). Ondeh Ondeh Cake at the Terrace (Conrad Centennial Singapore). La Mian at Golden Peony (Conrad Centennial Singapore). 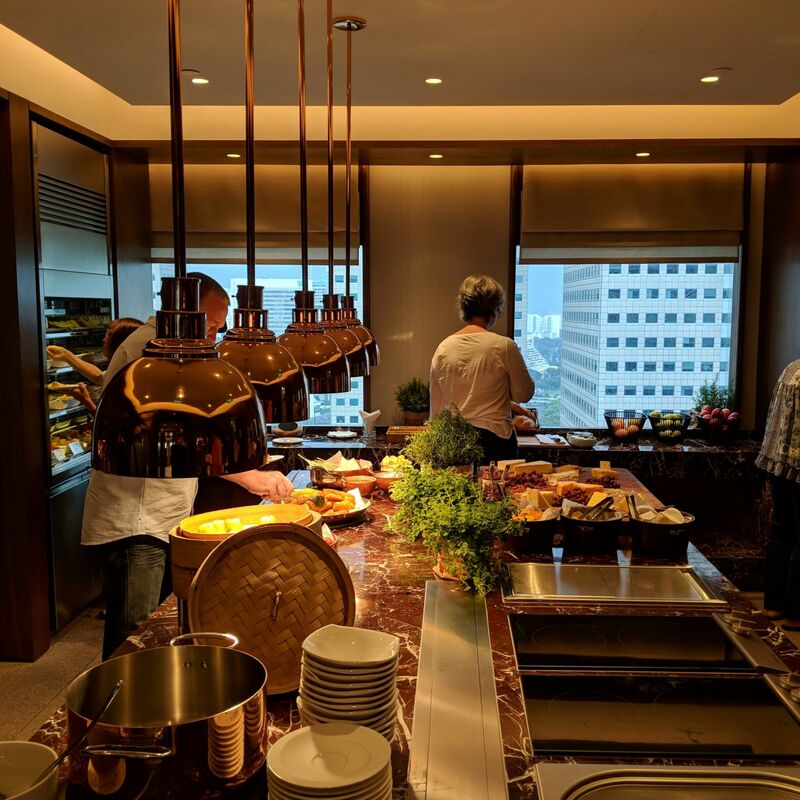 Aside from the luxurious comfort of the Centennial King Suite, another highlight of my stay at Conrad Centennial Singapore was the 31F Executive Lounge experience. Guests can enjoy buffet breakfast, afternoon tea, evening drinks with hors d’ouevres as well as beverages throughout the day at the gloriously sun-lit Executive Lounge. The 31F Executive Lounge is intended for suite and premium guests, but during my stay, due to the refurbishment works taking place for the 4F Executive Lounge, the latter guests were directed to the 31F Executive Lounge as well. Because the buffet spread and booze were housed in a small room next to the kitchen, this resulted in the situation at the buffet spread being fairly Black Friday-meets-warehouse sale-esque in its frenzy, with the staff visibly struggling to keep up with the flow of club guests. I noted every time I passed the utensils box that there never were any forks at any given time. 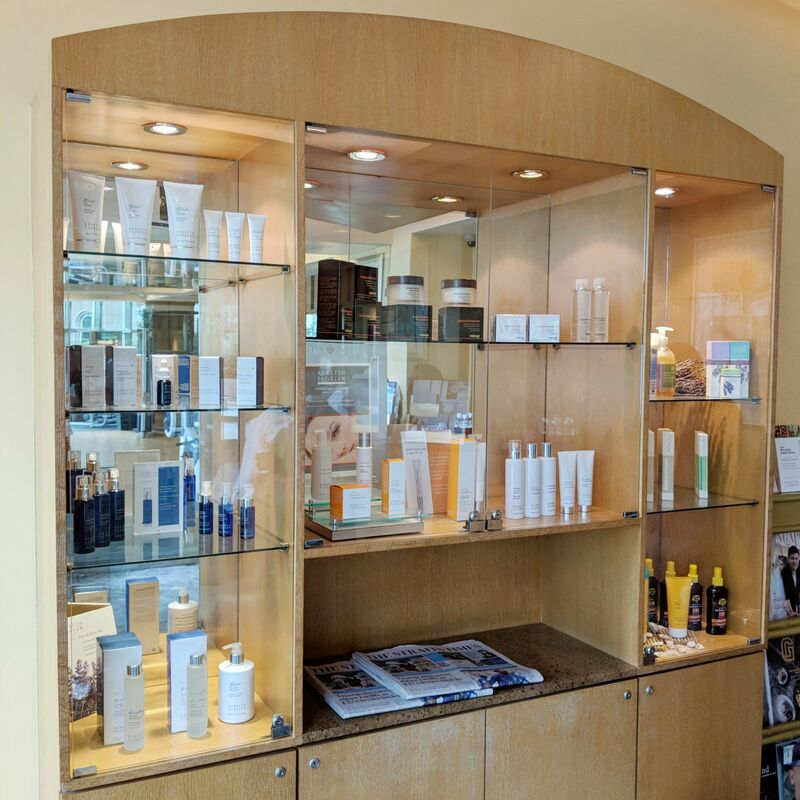 I had to wait for ten minutes at the 31F Executive Lounge counter before any staff were available to process my check-out. The crowd situation at the 31F Executive Lounge does not, however, take away any shine from the food and alcohol selection, which was unexpectedly great. During my two evening sessions at the Executive Lounge, the following dishes were served at some point: chicken satay with peanut sauce, Asian cocktail sausages, breaded calamari, butterfly prawns, mushroom pies, coffee bun with red bean paste, chicken siew mai, vegetarian spring rolls, and a varied selection of mini cakes and desserts. 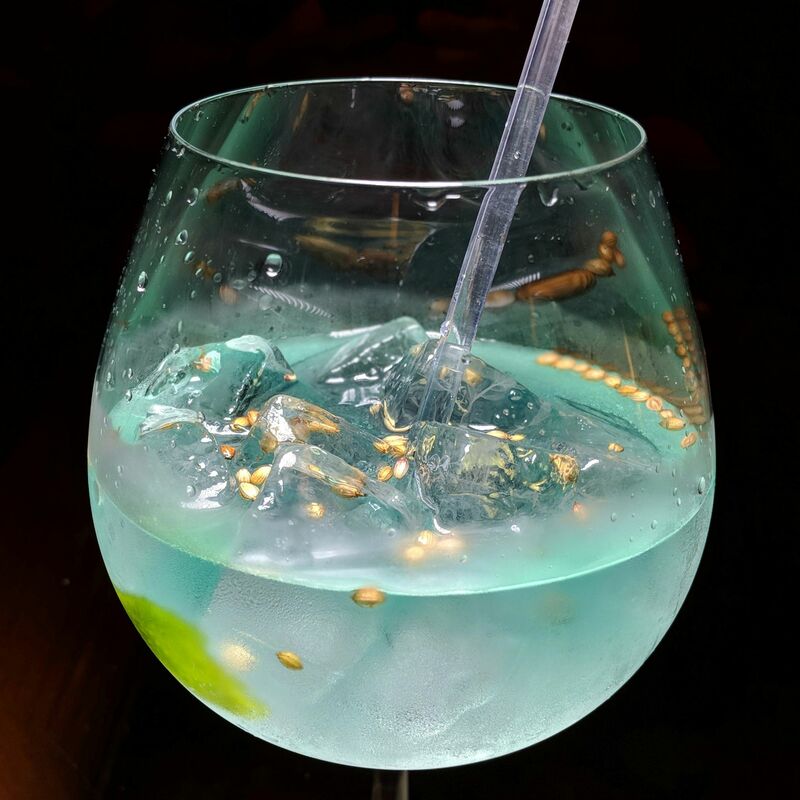 It is worth noting that different dishes are served throughout the evening, making staying throughout the entire duration of evening cocktails very rewarding. 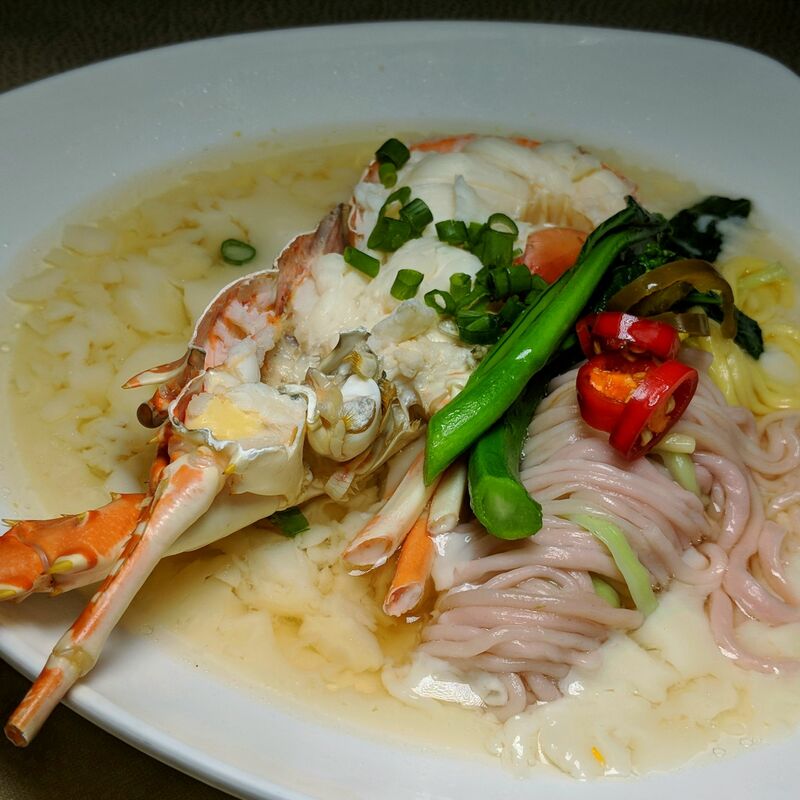 I was very impressed with the soup component – a rather marvellous herbal soup with wolfberries and crab meat was served one evening, and a rich tomato and basil soup was served the next. 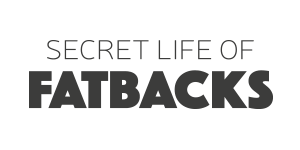 On the alcohol side of things, if wine and champagne are not your thing, you can opt to make your own cocktails, with a variety of spirits from Baileys and Johnnie Walker Black Label to Beefeater Gin available for your self-help degenerate drunkenness. 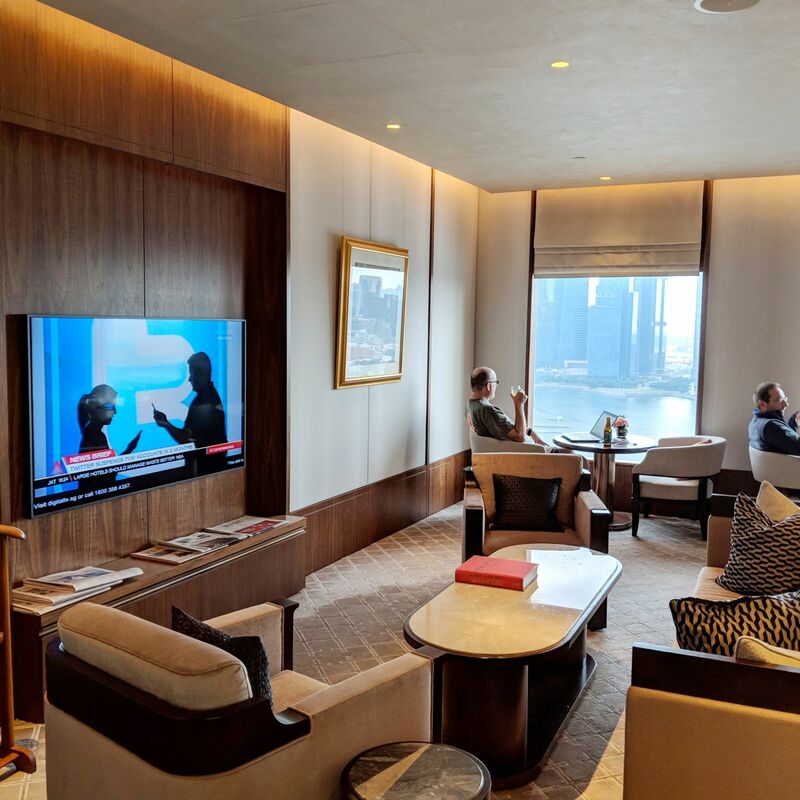 Parts of the 31F Executive Lounge possess a lovely view of the bay area, making the Executive Lounge ideal for National Day stays. 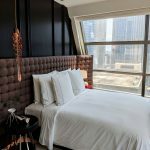 While I did not manage to secure a window seat, I was comfortably nestled in a room with two window seats and two sofa seats which had a fantastic view of the marina area (and Pan Pacific Singapore and Marina Mandarin’s facade). Throughout the evening, various club guests entered the room to look for seats as well as to check out the view, including a Japanese couple and an energetic, boyish Edison Chen-esque Chinese gentleman who had a very intriguing, feed-y relationship (don’t ask what that means) with his decidedly more normal-looking male friend. Across both evenings I was there at the lounge, I befriended several travelling couples from Australia and America, and we swopped travel stories over Laurent-Perrier La Cuvee Brut champagne. (Apparently the DoubleTree property at Amsterdam is quite something.) I have spoken on many occasions about the InterContinental Ambassador guest bonding experience at the club lounge, and it was refreshing to encounter self-proclaimed “Hilton whores”, including a lady who has been a Diamond member for sixteen consecutive years merely as a leisure traveller as well as an ex-Interpol businessman who is a lifetime Diamond member for having held the status for twenty consecutive years and having stayed over 1000 (?!?) nights. Cor blimey. When the afore-mentioned Hilton whore arrived at the Executive Lounge with her husband, she was greeted and entertained by various senior management, who sat with her and chatted with over rosé champagne that is decidedly not from the Executive Lounge, as well as gifted her with a special and exclusive Conrad map for her to check off the various Conrad properties around the world that she has completed. (Damn, I would love to have that map!) 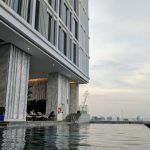 It was a rare glimpse of the high standard of hospitality and service that Conrad is undoubtedly capable of which was rather lacking across various elements of my stay. 31F Executive Lounge (Conrad Centennial Singapore). Buffet area at the 31F Executive Lounge (Conrad Centennial Singapore). 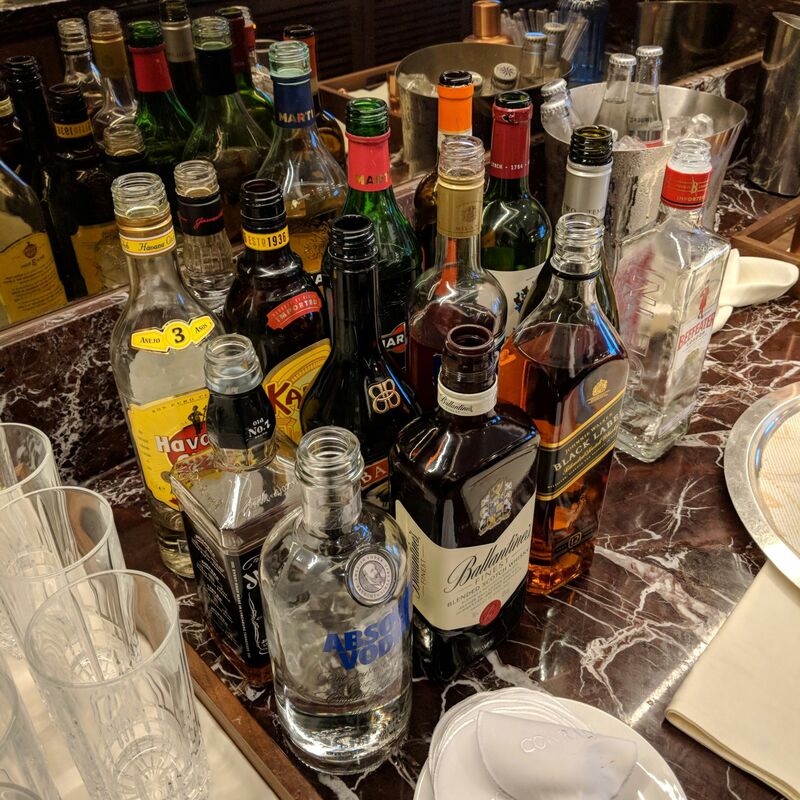 Alcohol selection at the 31F Executive Lounge (Conrad Centennial Singapore). 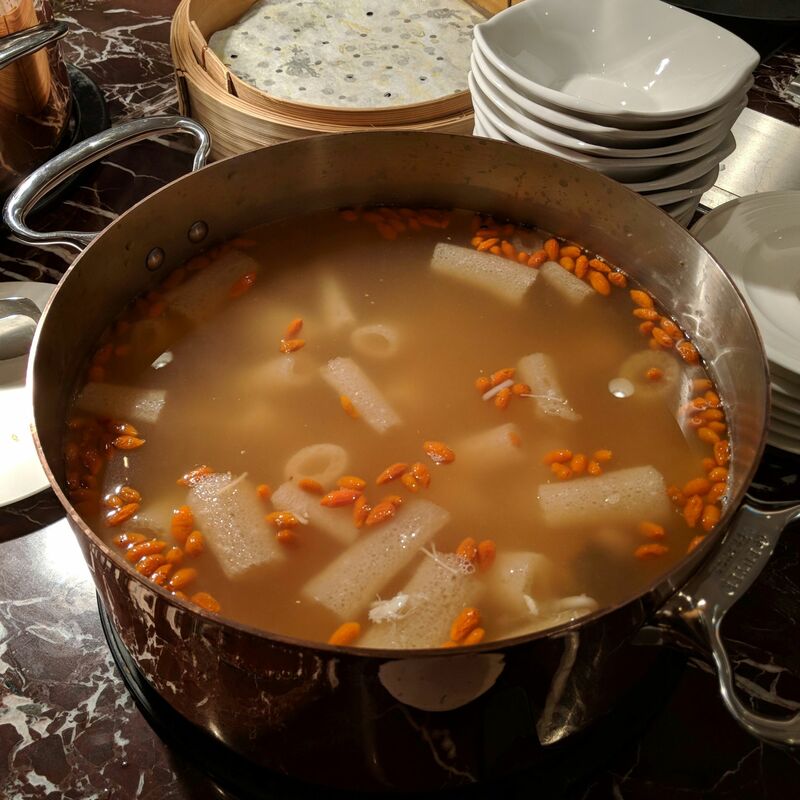 Soup served at the 31F Executive Lounge (Conrad Centennial Singapore). 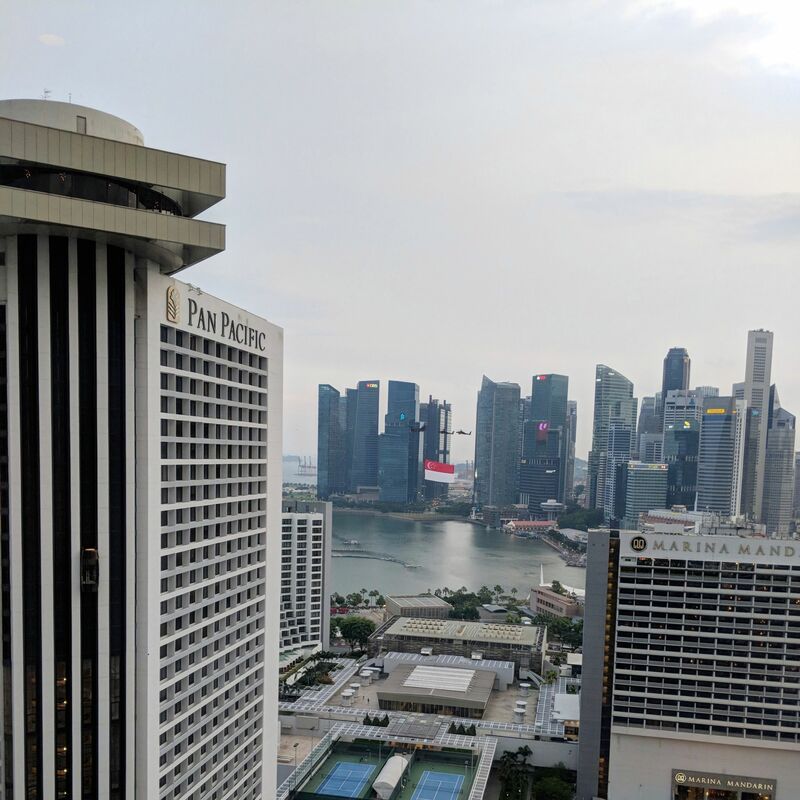 The view from the 31F Executive Lounge (Conrad Centennial Singapore). 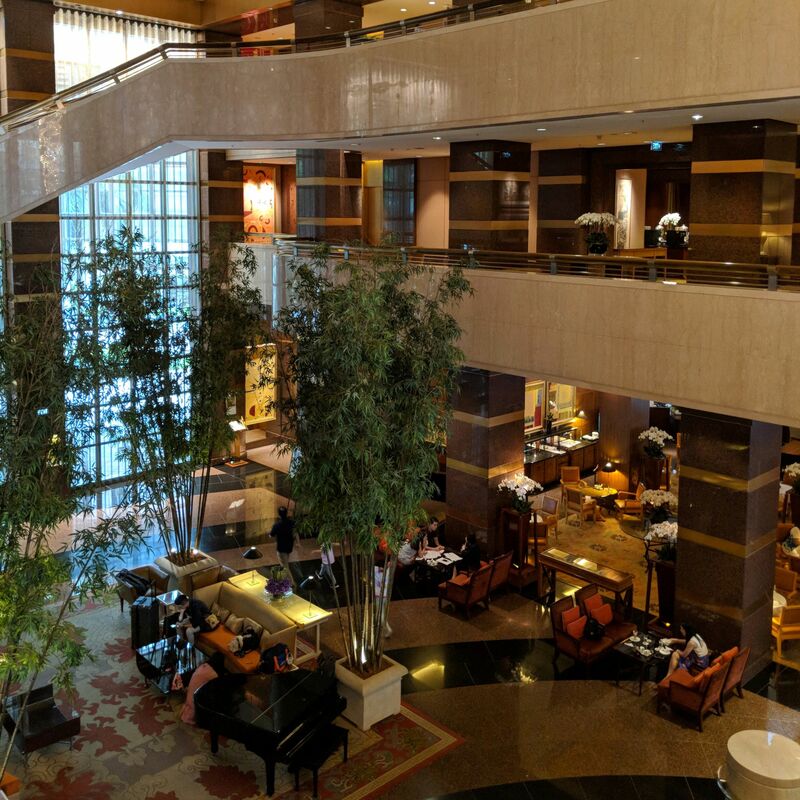 As I finished penning this post, I paused to note that whilst the Executive Lounge Manager at Hilton Singapore had sent an email to me a week prior to my stay (which is fairly standard for club guests), I did not receive a similar email from Conrad Centennial Singapore prior to this stay, which was booked quite a while back. 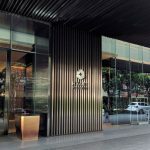 Whilst the updated and modern aesthetic as well as being decidedly more upscale and luxurious makes Conrad Centennial Singapore the preferred Hilton property in Singapore for many travellers, the resulting consequence is a frequently higher-than-average hotel occupancy which significantly affects the Conrad luxury experience and causes the proceedings to feel more transactional than transcendent. 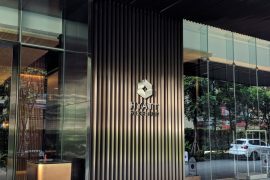 At current standing, I prefer the Hilton Singapore’s dated and old-fashioned but genuinely warmer brand of hospitality.